So chic.. I love the kitchen and bedroom! Beautiful, and warm, love it! Wow, this is perfection in my eyes! Thanks for posting! This is my absolute favorite sneak peak ever!!! So much of this could translate into my own life. Thanks so much for sharing! Rulers on the wall (on flickr photos)! Awesome. Oooh, this is beautiful. What a gorgeous home!! …I was seriously taken with Bonnee’s textiles last week, and this is just the most perfect extension of her style, and a wonderful backdrop for her work too. My jaw has still not closed shut after looking at these pics. You’ve used all my favoure colours throughout. I’m just ga ga over it. Such a beautiful home. Her sense of color just blows me away! 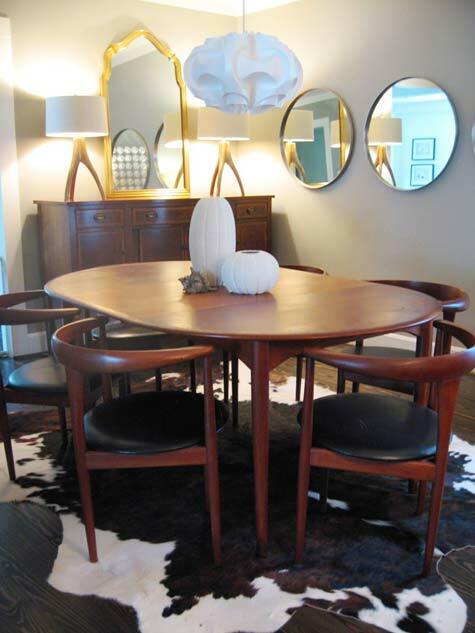 I also love the mix of mid-century pieces with older (and newer) pieces. Spot on! bonnee’s color palettes are crazy beautiful. i may have to steal the one in that guest bedroom. i love the paint in the bedroom. what color and brand? oh my lord, this is my dream house! i can’t stop looking at the guest bedroom. i also love the textiles used in the pics of the master bedroom! also, where are those tables from, in the formal living room? i love the shape of them! Thank you for all of your extremely generous responses! The master bedroom paint is Silver Sage, by Restoration Hardware, the guest bedroom is Flax, also by RH, I believe. The dining room is Intellectual Grey my Benjamin Moore…I believe that’s the maker! Wonderful – I’m going to be book-marking this sneak peek. I was wondering what the Ikea dining chairs are called as I can’t find them on the site? I just finished looking at my dear friend, Bonnee’s, gorgeous home. I am so proud of her and impressed by her talent. She is so well-deserving of this press, and I extremely happy she’s getting her opportunity to show off her work. Love the interior. I’m dying to know the paint color of the bedroom and the wall with the white bamboo chairs with orange upholstered cushions. Please tell! Wow I am so excited to see this sneak peak! It *think* its my favourite one yet, and I love how I went “ikea? really?” cause I haven’t quite been able to achieve that yet. It’s always nice to see designers include affordable, accessible furniture in with their vintage, one of a kind, or overly priced pieces! Thanks Grace! You are great and making those connections and sharing them with us! Don’t you just want to be friends with Bonnee? wow this home is absolutely gorgeous. I look at this and I feel comforted-it is my vision of the perfect home. BRAVO! I think your textiles are stunning and as soon as I pick up an antique chair from my grandmother I will be deciding which to reupholster in! 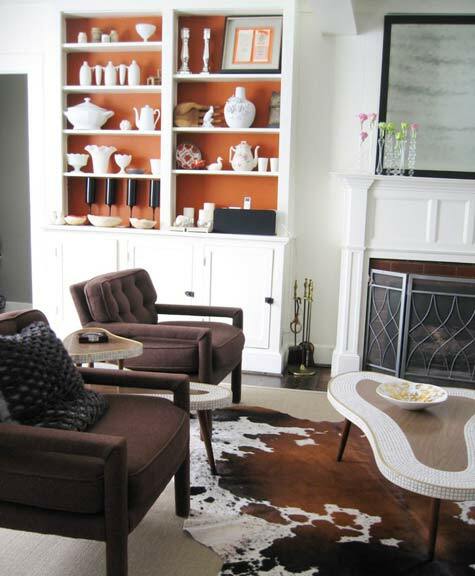 Would you be so kind as to share the name of the burnt orange color painted in your bookcases? I’m planning on moving to a new pad this summer and am SMITTEN by that color and want to use it!!! THANKS! lovely home especially the kitchen and the chandelier right up design sponge’s alley! My heart absolutely stopped for a second looking at this home. I adore it. It connects on some level that is not entirely understandable. It is GORGEOUS! Beautiful, Bonnee. I remember us talking some years ago about your dream to design fabrics. You’ve made it! I can’t wait to try some of these ideas. 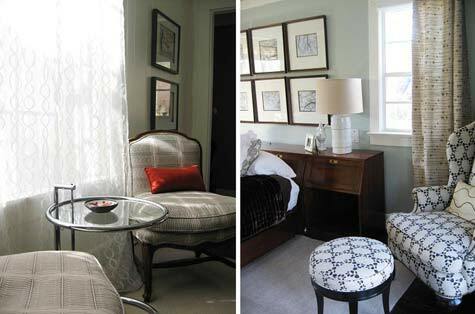 Pam T.
Bonnee – You home is full of your personal style and it is so neat that you have shared it for all to see. Kudos. Bonee has the most gorgeous, cosy but fresh style! LOVE it! This is by far my favorite sneak peek too date, beautiful taste, just beautiful! I am sure Grace loves that Kitchen chandelier! This is the most amazing house and sneak peek ever! Grace, thanks so much for sharing, and Bonnee, you are amazing!!! Ditto what Sian. Love those dining room chairs! I see similar, but not the same. What are they called? Are the cushions after market? Thanks! 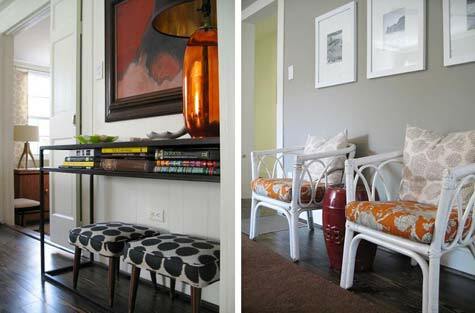 I love the use of stools throughout their apartment! Each room has it’s very own nuances and emotion :) So lovely! the chairs in the fourth photo that are from ikea…can anyone point me to them? all i see are NORDMYRA which don’t have the upholstery and don’t look quite the same in the backrest. are they discontinued? Such a stylish home! 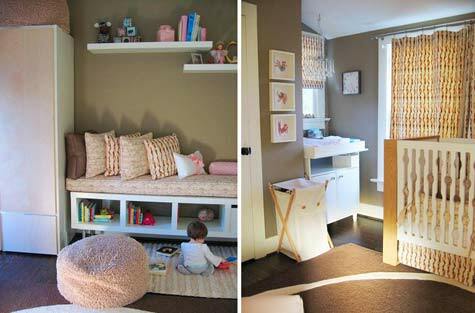 I love the little pops of orange everywhere and the baby’s nursery is adorable! And thanks for introducing me to Studiobon… I LOVE! That is a GREAT sneak peak. I adore her bedroom, the all white bedding just looks so cozy and comfy. And mixed with the green, my favorite color…it’s just sublime! What about the outside of the home? That’s what I asked myself… great landscaping? Nice yard? Yes, this is definitely a dream home. And alack and alas, one I’ll never be forunate enough to live in! What a wonderfully refreshing photo to grace your front page! I was referred to this site by a friend and have been practically salivating over the gorgeous designs splashed all over the place. I really need to update my home and I will be coming back here often for new inspiration. Thanks for sharing these beautiful pictures of a gorgeous home! love it! i love the rusty orange and all the little elements of details here and there. thanks for sharing! I’m wondering about those dining chairs too…Did you alter them? I’d love to know if they’re still available at Ikea…I’m not recognizing them on the site. : Thanks Grace! Your home is beatiful, definetly reflects your talent. LOVE IT! LOVE IT! LOVE IT! The small bursts of color are gorgeous; the orange behind the shelves, the green cubes at the foot of the bed, and the clean white look of the kitchen…lovely. The best sneak peak yet! Thanks for sharing. i too am really curious about the white/black chairs from ikea. is that from a few seasons ago? i love them. Gorgeous home – thank you for sharing! What type of curtain rods are you using throughout your home? They’re the perfect size and weight … I’m trying to find the same thing. This sneak peak is so inspiring!!! 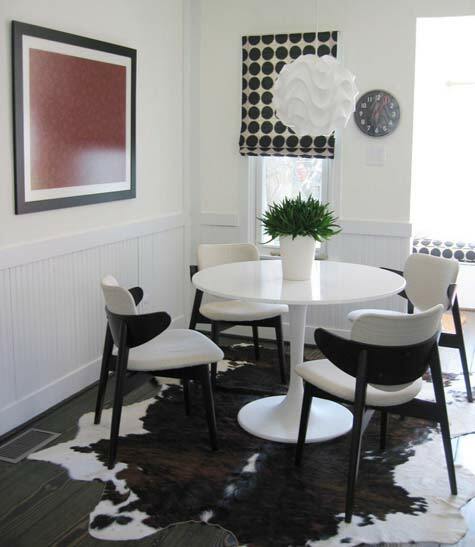 Please do tell us how to find the black/white IKEA chairs. They have great lines. I believe the Ikea chairs were discontinued. We tried to buy 2 more a year after we purchased them (2006) and couldn’t find them ourselves. Hmmmm. I wish I remembered what they were called. I apologize! I have to agree, this is the best sneak peek yet. The living room coffee table? Made? Found? I love the color of the master bedroom…does anyone know what it is? I would love to know where you found the rug in the study lounge…..I believe it is brown with blue hexagons? THANKS. wow! beautiful interiors!! I love the way she mixed vintage with a bit of glamour with a comfortablness that is so welcoming! Bonee did a beautiful job! beautiful! I am in awe of Bonnee’s talent at design, eye for beautiful fabrics and warm, fresh colors, and with her amazing presentation! Thank you for sharing this! 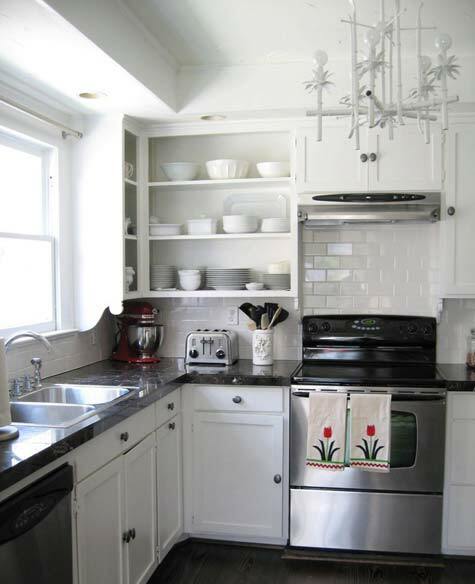 I love the kitchen with the stainless accessories and great chandelier. I bet Bonnee is an incredible chef. Absolutely stunning! Inviting, warm and hip. Love to see it live, looks so fresh! Where are the brown living room chairs from? They’re great! beautiful house, unfortunate choice of rug however. I agree with Gail about the rug(s).. not only that, I wouldn’t have repeated that particular piece in several rooms. Everything else is quite fitting though. so beautiful love the combination of the rugs and the furnitures. I love almost everything here! 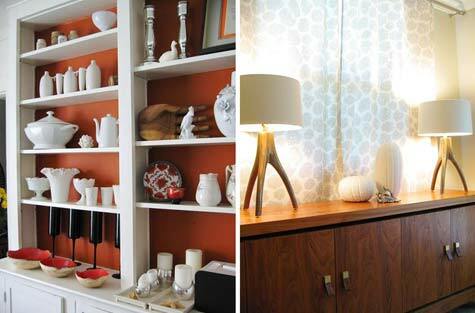 deep orange is my absolute favorite color– what is the brand and name of the shade used in the built-in’s interior? i’m renovating and looking for color ideas. thanks! Your home is so gorgeous. Love the kitchen and the nursery!